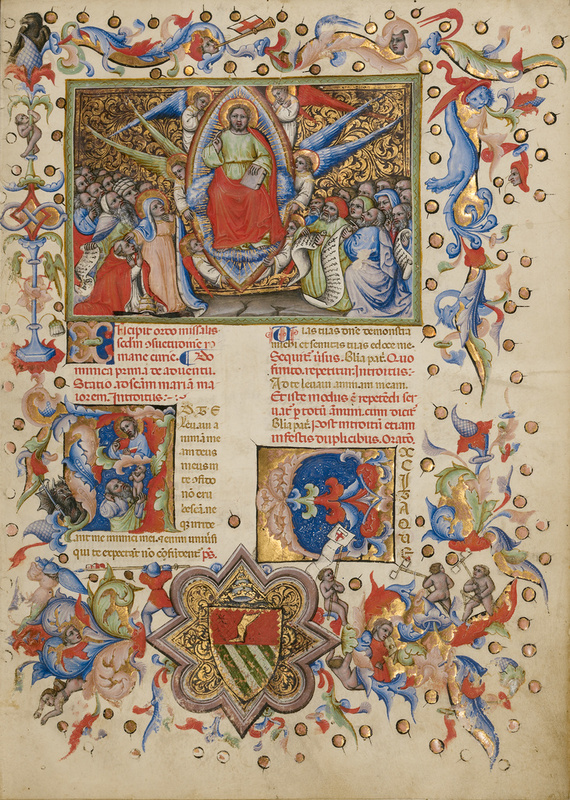 In Cosimo de' Migliorati's missal, the illuminator gave special prominence to the page for the first mass of the church year, said on the first Sunday in Advent. In the miniature of Christ in Majesty, Christ appears in a mandorla surrounded by a multitude of worshippers both male and female and prophets with their scrolls. The use of gold for the decorative acanthus swirls in the background, the halos, and the rays surrounding Christ reinforces the majestic tone. In the initial below the miniature, a bearded man offers his soul in the form of a small, naked figure to Christ above. This image was inspired by the opening verse of the introit, sung by the choir as the priest proceeds to the altar at the beginning of the Mass: "To you, O Lord, I lift up my soul." A series of richly colored acanthus leaves forms the shape of the letter A and extends into the margin. In addition to the drolleries, the border decoration originally included the arms of Cosimo de' Migliorati, but these were overpainted with the arms of a later owner of the manuscript, the Antipope John XXIII.